While there's a lot of attention being focused on what or who is missing from the Avengers: Endgame trailer, there's quite a bit in there to dissect. Specifically, the Scott Lang scene is one that could possibly tease the arrival of time travel into the storyline. It has already been confirmed that the Quantum Realm will play a large part in the movie, and there has been a lot of speculation about time travel, though it has never been confirmed by Marvel Studios. 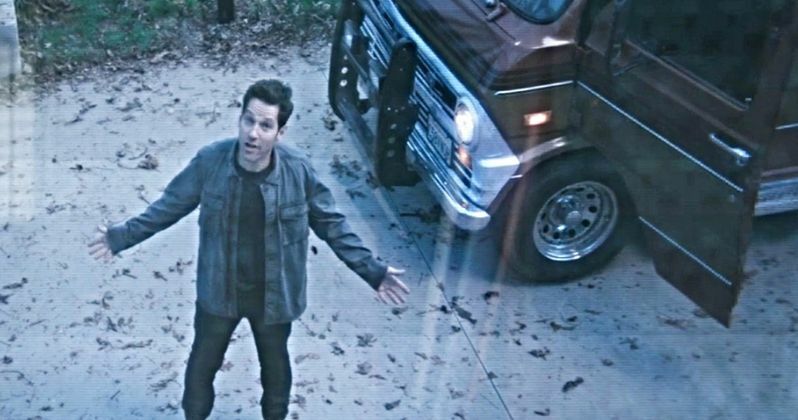 At the end of the Avengers 4 trailer, Scott Lang appears at the Avengers facility in New York. Captain America and Black Widow see him come up on the surveillance camera after a previous scene showed Bruce Banner looking at pictures of the missing heroes, including Lang. Cap seems confused and asks, "Is this an old message?" Black Widow doesn't answer the question directly, only stating, "the front door." You can see Lang trying to explain who he is and where he last saw them, which was at the German airport during Civil War. The Russo Brothers obviously want us to believe that Scott Lang magically popped out of the Quantum Realm in present day and landed in New York. However, if you look at the surveillance screen closer, it clearly says "archive" in the top-left corner, meaning that the video is old. But, how old is it? That's the real question. Lang was kept safe from Thanos' snap while in the Quantum Realm, but it isn't clear how he got out, or when he shows up at the Avengers facility. If that video is post-snap, the surviving Avengers will know that they need to get in contact with Lang somehow. It's also not clear how long Scott Lang was trapped in the Quantum Realm. He may have found some help by going through a time vortex that he was warned about by Janet van Dyne. The Avengers: Endgame trailer doesn't make it look like a whole lot of time has passed, especially with Tony Stark running out of food and water while stranded in space. This is where Captain Marvel could come into play. Carol Danvers is absent from the trailer, but there have been hints that she will tie into the Quantum Realm at some point. Scott Lang will more than likely have some knowledge about the Quantum Realm and its mysterious powers as well as access to Hank Pym's tech, which will probably be a huge factor. Again, this is all speculation, but it appears that Avengers: Endgame will involve some time travel, which was teased in early leaked set photos showing the Battle of New York from the first Avengers movie. As with everything having to do with Marvel Studios, the details are going to be kept under wraps until the day of the premiere. Hopefully, Marvel Studios provides some more clues in the coming months.